It has been an exciting and busy time in the Dutta household with the final countdown for the new arrival and finally the advent of our 2nd angel Ryka on 30th September 2015. ‘Ryka’ means born out of prayer. The name acquired from the prayer of an innocent heart of my elder daughter who has been wanting a baby sister since she was 2! It just goes to show how an earnest and unselfish desire of wanting something has a way of coming true! Such a blessed feeling ???? Like most traditions, the arrival of a new life is always a big celebration! Its no different in the Indian culture too, just that is has to start with something sweet. We offer sweet to God first and then to all visitors who come to our house as mark of being thankful for the new blessing. Its considered auspicious! Given the fact that I have had my hands full with a little bundle and recovering from a c-section, my choice of making a quick sweet treat that was easy to prepare and make was limited. Although one could easily buy sweets from the shops but I wanted to make something at home for its more fulfilling and I had the help of my mother being around too! Also it required something which my global friends would not mind tasting or eating since Indian sweets are an acquired taste. Not all enjoy it as they would enjoy an Indian main or a side dish! The one sweet which came to my mind instantly is ‘Coconut Almond Laddoo’. I call it the Indian version of Ferroro Rocher Coconut Raffaello chocolates! Just that it does not have any chocolate. ‘Laddoo’ in hindi means balls, and that is what this sweet is. Coconut and almond balls. The ingredients are easily available in any local supermarket. Just snap the packs and open a tin and voila that’s all you need! 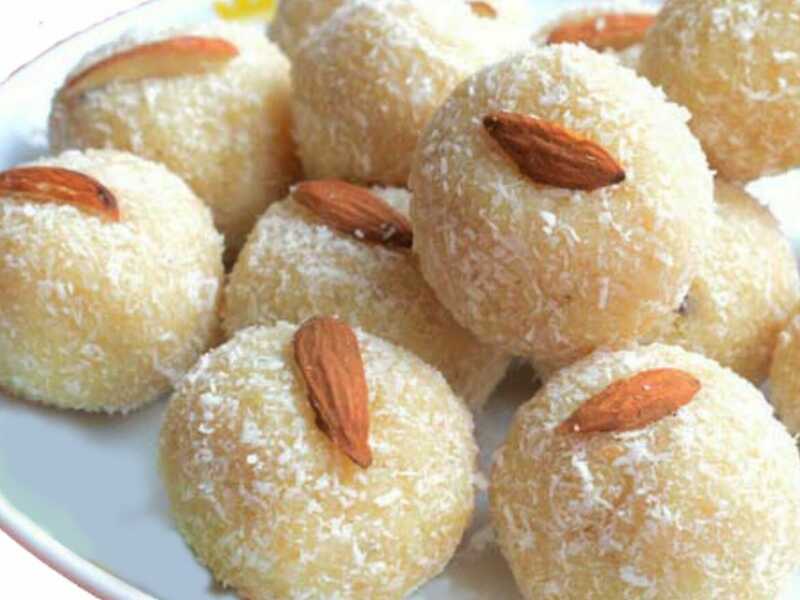 This sweet is super easy to make and the universal taste of coconut, dry fruits and condensed milk are flavours not too alien to all so most would at least attempt to try it!! So here I am sharing my happiness, with the wish of sweet beginnings with our new marvel! Heat a flat bottomed pan (preferably heavy bottomed) and add 2 cups of coconut to the pan. Roast on medium to low flame for about 2 mins stirring constantly so that it does not stick to the bottom. Next add the almond powder to the coconut and mix together for further 1 to 2 minutes. Some recipes use ghee (clarified butter) but I prefer not to as coconut and almond both release their own oils while being roasted! You will see the mixture becoming a bit greasy in this process. Remember to keep the heat low else it will start to become brown which you must avoid from happening. Continue mixing until the mixture becomes dry and sticky. It usually takes around 5 – 8 minutes but depends on the level of heat and the quality of the pan you are using. The mixture should stick to the spatula and refuse to fall and stirring would become hard. Turn the heat off at this point and set the mixture aside. It is now time to roll it into balls once the mixture is cool enough for you to handle. You should not let it go cold as it would become difficult to roll it. Once they have been rolled into balls, roll it on a plate of dry desiccated coconut and coat each ball evenly. Finish the laddoos with half an almond on top for garnishing. Now slowly add the condensed milk to the mixture and mix well using the lift and drop motion so that the entire mixture gets absorbed by the condensed milk. Also add the cardamom powder and raisins at this stage and mix thoroughly. Finish the laddoos with half a almond on top for garnishing.